Address: Avenida Bruselas, s/n, Adeje (Tenerife), Islas Canarias. 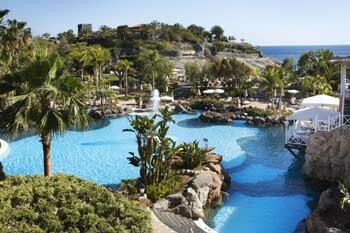 Overlooking Duque Beach in Tenerife, the luxurious Bahia Del Duque is surrounded by 6 hectares of subtropical gardens. It offers 5 outdoor pools, fitness centre and stylish accommodation with private balcony. At Gran Hotel Bahia del Duque Resort you can choose between modern rooms and chic villas. All accommodation comes with LCD satellite TV and a bathrobe and slippers. The Gran Bahia del Duque complex offers 8 restaurants, including Italian and Oriental options. There are also 7 bars, including a juice bar and a beach bar. The hotel offers a huge variety of leisure activities, including aerobics classes and whale watching. There are tennis courts, a table tennis table and a botanical walking route. Adeje Golf Course and Siam Water Park are around 5 minutes’ drive from the Bahía Duque. You can drive to Tenerife Sur Airport in around 15 minutes.